We feel so lucky that we have been able to go boating so much this summer. None of us grew up boating, so we aren't very excelled in our waterskiing, wakeboarding, and wakesurfing skills. We are glad for Tricia's fiancé, a California surfer, who has been able to show us a thing or two. Blake now measures his time in terms of how many more naps he has to take before we go on the boat again. He loves the boat to say the least. 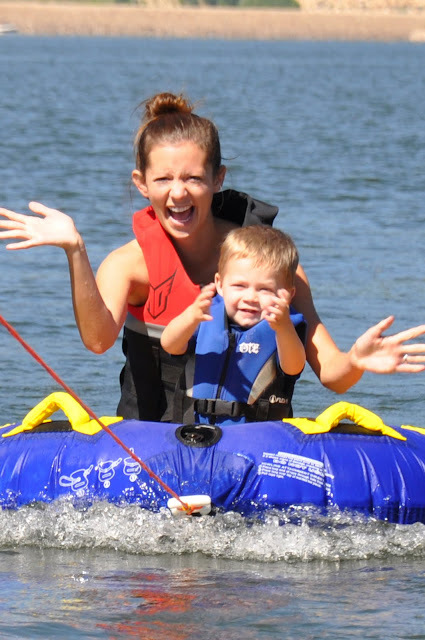 I took him on the tube with me for the first time this weekend. He squealed in delight, even though I wouldn't allow us to be pulled more than 5 mph. 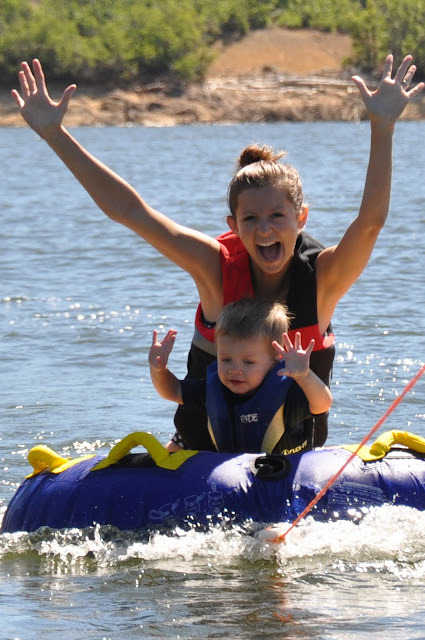 Wakesurfing is always a hit. I probably should have been paying attention to my board more instead of waving at my son on the boat. This is why: notice everyone on the boat going about their business, with me completely biting it in the background. I inhaled some serious lake water. Aunt Tricia taught Blake how to make Pringles into a duck beak. 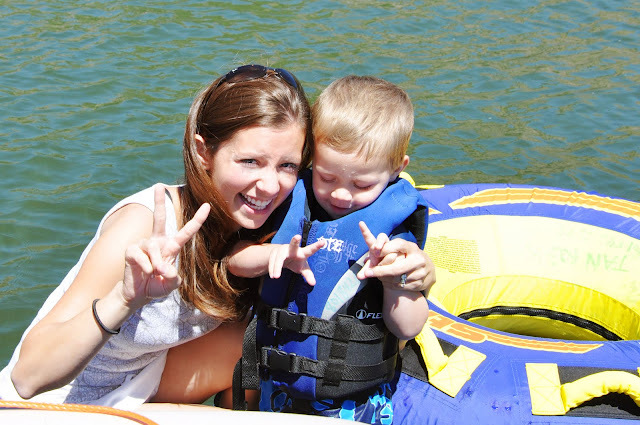 I tried to teach Blake how to do the peace sign. It was tricky for him. The lake was up to a whopping 72 degrees, which is about the highest it ever gets. We took advantage of the warmth and dove in sans bodysuits. We even let Blake go swimming. He jumped off the boat ledge about 50 times and had the time of his life. That picture is hilarious! In case you didn't know this about me- American's Funniest Home Videos (or AFV as I lovingly call it) is my favorite show. About the Ben Folds concert- I wish we could have met up! We definitely need to get together. I'll e-mail you the idea that Shawn had when I saw her at my sister's wedding reception.